The term became a centerpiece of the program of the German nationalist movement in 1891, with the founding of the Alldeutschen Verbandes, in the words: „Der alte Drang nach dem Osten soll wiederbelebt werden“ ("The old Drang nach Osten must be revived"). Nazi Germany employed the slogan in calling the Czechs a "Slav bulwark against the Drang nach Osten" in the 1938 Sudeten crisis. Pomerania is a historical region on the southern shore of the Baltic Sea in Central Europe, split between Germany and Poland. 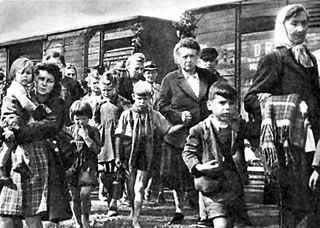 The Nazi–Soviet population transfers were population transfers between 1939 and 1941 of ethnic Germans (actual) and ethnic East Slavs (planned) in an agreement according to the German–Soviet Frontier Treaty between Nazi Germany and the Soviet Union. The history of Pomerania starts shortly before 1000 AD with ongoing conquests by newly arrived Polans rulers. 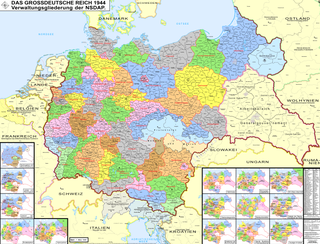 Before that the area was recorded nearly 2000 years ago as Germania, and in modern-day times Pomerania is split between Germany and Poland. The name Pomerania comes from the Slavic po more, which means Land at the Sea. The Expulsion of Poles by Germany was a prolonged anti-Polish campaign of ethnic cleansing by violent and terror-inspiring means lasting nearly half a century. It began with the concept of Pan-Germanism developed in the early 19th century and culminated in the racial policy of Nazi Germany that asserted the superiority of the Aryan race. The removal of Poles by Germany stemmed from historic ideas of expansionist nationalism. It was implemented at different levels and different stages by successive German governments. It ended with the defeat of Nazi Germany in 1945. Ostsiedlung, in English called the German eastward expansion, was the medieval eastward migration and settlement of Germanic-speaking peoples from the Holy Roman Empire, especially its southern and western portions, into less-populated regions of Central Europe, parts of west Eastern Europe, and the Baltics. The affected area roughly stretched from Estonia in the north all the way to Slovenia in the south and extended into Transylvania, modern-day Romania in the east. In part, Ostsiedlung followed the territorial expansion of the Empire and the Teutonic Order.